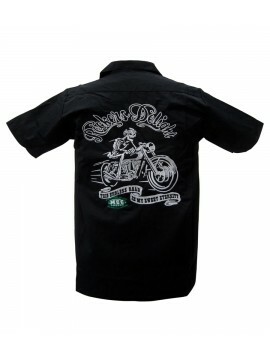 Rockabilly shirts for men are the staple of any greaser wardrobe. Whether you’re out on your motorcycle or hanging with your boys by your classic cars, these men’s work shirts tell them you mean punk rock business. 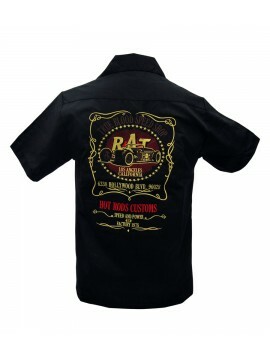 Our bowling shirts feature every rockabilly design you could ever dream of. 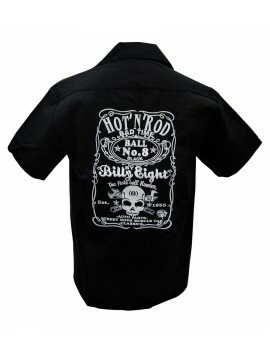 From gambling skull cherries, skulls and crossbones, hot rod themes, classic cars, tattoos and more. Choose from an extensive selection of button up collared long sleeve hot rod shirts to short sleeve men’s work shirts. 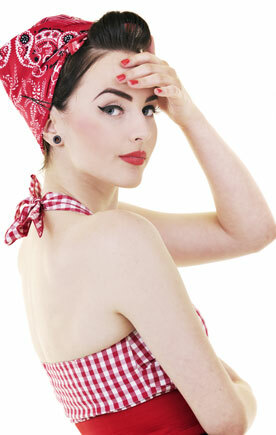 Whatever your rockabilly style, we have what you're looking for. 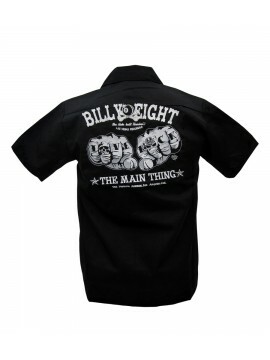 This short sleeve black button up work shirt features intricate embroidery detailing a classic car s.. 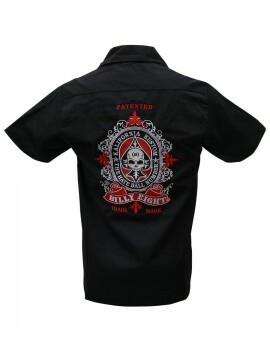 This Death Gains men's work shirt features two pockets in the front and buttons up to a black collar.. This shirt features a play on skull and crossbones and says everything you need to know about auto p.. This collared button up shirt features a skeleton riding into the night on a motorcycle, as well as .. This long sleeve shirt features famous tattoo designs such as mermaids, hearts, monsters and more. T.. 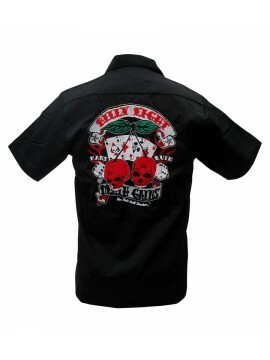 This short sleeve button up work shirt features a button up closure and two panels of spooky tattoos.. 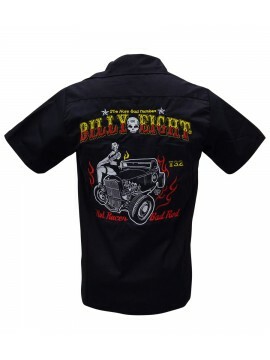 This men's rockabilly work shirt features intricately embroidered depictions of classic car engines ..
Men's black work shirt has two pockets and a button up front. This True Blood shirt features an angr.. 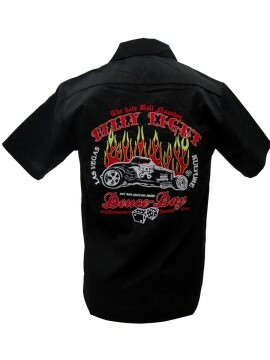 This black men's rockabilly work shirt features a classic car on the back lit up in flames with a go.. 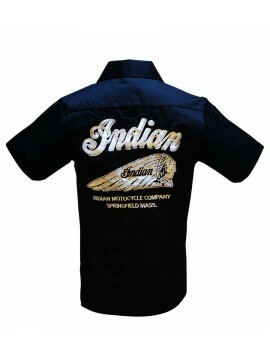 This short sleeve black button up features two pockets and an Indian Motorcycle Company logo on the .. 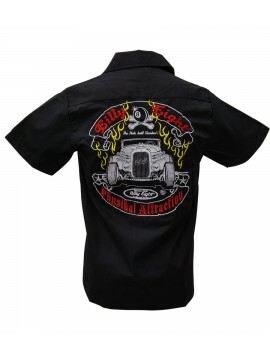 This Deuce Day men's button up shirt features extensive Hot Rod embroidery. The classic car sits ami.. This black collared shirt has two pockets in the front and a button up closure. This shirt depicts t.. This long sleeve black shirt features black snap buttons and a skeleton mariachi party illustration .. 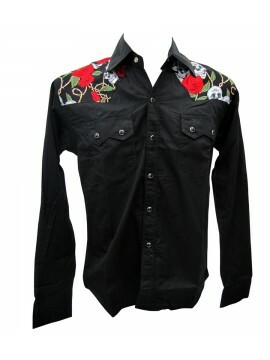 This long sleeve collared men's work shirt features playful skull and roses designs on the shoulders.. This men's short sleeve work shirt has two pockets, a black collar, and button up closures. This shi.. 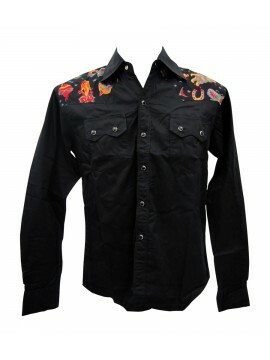 This black collared short sleeve shirt has two pockets in the front and an intricate design on the b.. Laughing skeletons and skulls with rose headbands decorate two front panels in this short sleeve men.. 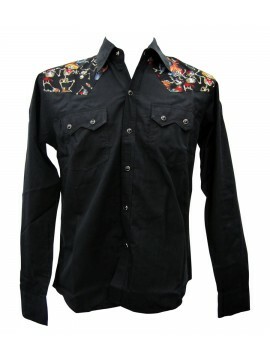 This black collared work shirt has short sleeves and a button up closure. This shirt features two po.. This men's button up, collared black shirt features two pockets in front and a button up closure. De..